nopAccelerate can improve your site in a variety of ways. Or you can start a free trial. In a nutshell, we’re integrating nopCommerce with Apache Solr to give you a Rock Solid e-commerce platform that is FASTER, SCALABLE & RELIABLE. Learn what we’re fixing & how! If not yet, let me introduce to it. nopCommerce is a very popular open-source e-Commerce solution. It provides number of enterprise ready features that are only available on proprietary e-commerce software. Compared to other open source ecommerce solutions, nopCommerce’s project structure is very well managed and easier to customize and extend. It is built on the top of latest ASP.Net 4.5 MVC4 and using latest techniques like Inversion of Control & Dependency Injection to make it even robust. For database layers it uses Entity Framework to make maintenance & customizations even easier. It is compatible with MsSQL 2005 and MsSQL 2008, and can be used to power small to medium sized full featured e-commerce portals. With few modifications, it can be scaled to support larger e-commerce portals. Why & When it becomes slow? 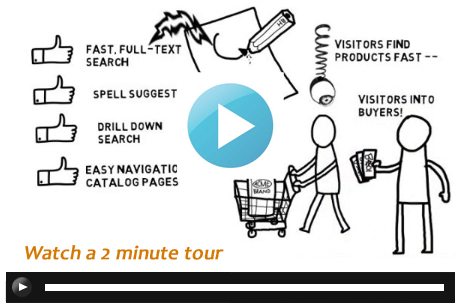 Faster data retrieval is the key for any high traffic e-commerce website. When data retrieval is slow visitor experiences a slowdown. Now, if you have a large product catalog with lots of filters applied to each product for easier layered navigation, database queries get slow. This slowdown is not noticeable for low traffic sites. But when you have a large catalog with more traffic that makes too many database queries, after some point you reaches to a limit beyond which you cannot support traffic without adding more infrastructure (a more capable server with very high CPU & RAM capacity). Now imagine a system that is specifically designed to retrieve data blazingly fast yet allow you to store data with same flexibility & relationships as you have in traditional RDBMS like MSSQL. Let’s look at the Solution! Apache Solr is designed just to do this! Apache Solr stores data in a single document kind of structure so it doesn’t need to make joins every time data is retrieved. And for speedier retrieval, it stores everything in its index with reverse indexing just like Web Search Engines like Google do. So you can make several kinds of search queries with facets, range queries, filters, etc. at the same ease & speed. Moreover, you can configure Apache Solr to load whole index in RAM to boost its response time. Hence, with nopAccelerate, we are adding a new component into nopCommerce architecture. So instead of making queries to the database, your store will be making queries to the Apache Solr which doesn’t slow down your store, and utilizes lesser RAM & CPU which make your nopCommerce store more reliable and gives you more room to scale. Apache Solr is an open source Ultra-fast Lucene-based Search Server. It is highly reliable, scalable and fault tolerant, providing distributed indexing, replication and load-balanced querying, automated failover and recovery and more. Solr is integral part of many of the e-commerce applications. It powers the search and navigation features of many of the world’s largest internet sites such as Netflix, AOL, CNET, Zappos and many more. It’s Open Source, Reliable, Fast, Scalable and with Proven Capabilities. Are you confused about anything?